Q: Wasps keep swarming the hummingbird feeders in my backyard. How can I deter them? A. Unfortunately hummingbirds aren’t the only ones attracted to sweet sugar water. But we’ve compiled five tips to keep wasps away from your hummingbird feeders. 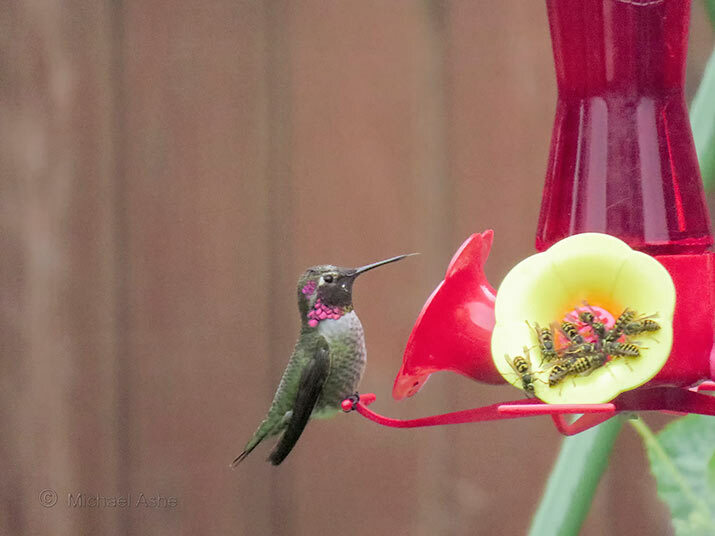 Some hummingbird feeders feature little yellow flowers that act as wasp guards. Unfortunately they didn’t do their homework about wasps, because it turns out these insects are actually attracted to the colour yellow. The next time you’re shopping for a hummingbird feeder, pick another colour! Try using a saucer shaped hummingbird feeder. Try as they may, wasps won’t be able to reach the sugar water, however hummingbirds will have no problem sipping it with their long tongues. Try relocating your hummingbird feeder. You don’t have to move it far, even just a few feet. Hummingbirds won’t have any problems finding the new location but the wasps just might! Be sure to clean up any sugar water drips and/or leaks.